Not to be confused with Ector, Texas. According to the U.S. Census Bureau, the county has a total area of 902 square miles (2,340 km2), of which 898 square miles (2,330 km2) are land and 4.1 square miles (11 km2) (0.5%) are covered by water. Ector County has an average rainfall of about 14 in per year and a warm, sunny, semiarid climate. Most of the county is relatively flat, with small areas of slightly rolling terrain. The area is known for its stark landscape. The few naturally occurring trees are mostly mesquite trees, which more resemble large bushes. As of the census of 2000, 121,123 people, 43,846 households, and 31,700 families resided in the county. The population density was 134 people per square mile (52/km²). The 49,500 housing units averaged 55 per square mile (21/km²). The racial makeup of the county was 73.69% White, 4.61% African American, 0.83% Native American, 0.64% Asian, 0.04% Pacific Islander, 17.38% from other races, and 2.81% from two or more races. About 42.36% of the population was Hispanic or Latino of any race. Of the 43,846 households, 38.90% had children under the age of 18 living with them, 54.10% were married couples living together, 13.70% had a female householder with no husband present, and 27.70% were not families. About 24.00% of all households was made up of individuals and 8.90% had someone living alone who was 65 years of age or older. The average household size was 2.72 and the average family size was 3.25. In the county, the population was distributed as 30.40% under the age of 18, 10.50% from 18 to 24, 27.90% from 25 to 44, 20.20% from 45 to 64, and 10.90% who were 65 years of age or older. The median age was 32 years. For every 100 females, there were 94.70 males. For every 100 females age 18 and over, there were 90.90 males. The median income for a household in the county was $31,152, and for a family was $36,369. Males had a median income of $30,632 versus $21,317 for females. The per capita income for the county was $15,031. About 16.10% of families and 18.70% of the population were below the poverty line, including 23.90% of those under age 18 and 14.30% of those age 65 or over. 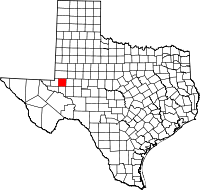 ^ a b "Ector County Profile". Retrieved January 21, 2017. ^ Gannett, Henry (1905). The Origin of Certain Place Names in the United States. Govt. Print. Off. p. 114. ^ "Annual Estimates of the Resident Population: April 1, 2010 to July 1, 2017". American FactFinder. United States Census Bureau. Retrieved 2019-03-01.